Introduced in 2002 by the University of Minnesota, La Crescent is the result of crossing two selections developed by Elmer Swenson, a pioneering grape breeder who introduced a number of new cultivars that are hardy in the Upper Midwest. Plant attributes include extreme cold hardiness (as low as -36°F), good vigor and production, and moderate resistance to many of the common fungal diseases. 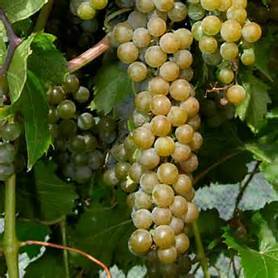 Grapes mature to a golden color on long, loosely bunched clusters in late summer. Harvesting occurs mid-season. Click here to view the commercial we produced for the LaCrescent grape.